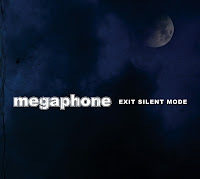 Orlando hard rock quartet Megaphone, released their latest album, Exit Silent Mode this past August. I wasn't sure what to expect when the record landed in my hands but, that's never stopped me for popping a disc in the player and giving a spin. 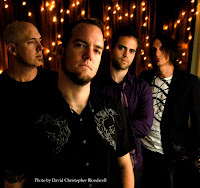 Megaphone, who formed in 2004 are, Matt Bloodwell (guitar/vocals), Paul Smith (lead guitar), James Woodrich (bass) and Scott Smith (drums). Exit Silent Mode, produced by Bloodwell and Justin O'Neill is the bands second full-length record. The record kicks off with "Write It Down" a song that sounds like what would happen if Stone Temple Pilots and The Foo Fighters joined forces. I think it's a good opener for the album, a nice area rock anthem if you will, and is followed by the punchy "Gravitate" that works to get your head bobbing along. It also has the most noticeable guitar solo. As I continued to listen, I started to think they reminded me of The Goo Goo Dolls before they went well, gooey. At the same time I started to think I could hear some latter day Def Leppard type sounds floating about. What? You didn't think I could write about a record without offering up some sort of potentially questionable comparisons, did you?! While this is a hard rock album, they offer enough hooks and pop nuances to entice casual hard rock listeners. Megaphone finds a nice comfortable blend of kick you in the gut, Mama said I shouldn't listen to this, guitar rock and easily digestible commercial rock. The album overall is a solid piece of work. It reminds me of the stuff I listened to as a wee teen in the 80's (minus the Aqua Net induced hair nightmares) without sounding annoyingly dated as well as managing to touch on the 90's alternative rock sound. Exit Silent Mode is one of those records that makes you think you've heard it before but you haven't. It's just a comfortable, familiar sound that fits well in a hard rock fans music library. The standout tracks on the record for me are "Whisper" which is my favorite, "Write It Down," "The Sin" and "Horse You Rode In On." Check them out for yourself. Have a listen to "Write It Down" and "My Favorite New Disaster" from Exit Silent Mode below.